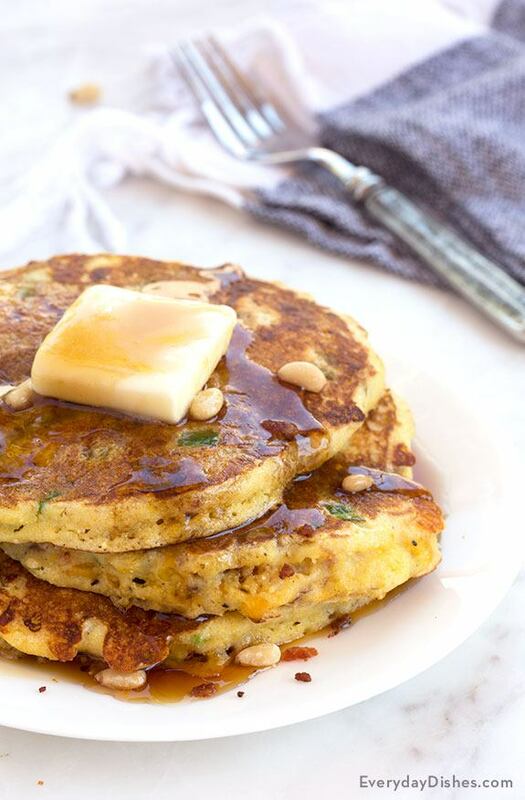 Our green chili pancakes recipe will set the bar high on all future pancake endeavors. Store-bought mix will be a thing of the past after you discover how easy they are to make and how crazy delicious they taste! Once you combine all the ingredients, it’s important not to overwork the batter. The goal is to preserve many of the bubbles in the batter by the way of scooping gently rather than stirring the batter—that way, you’re sure to achieve the most perfect and light pancakes. We made ours on an electric griddle. They’re inexpensive and invented specifically for pancake enthusiasts because they heat evenly and have handy thermostats to control the temperature. Additionally, they don’t have sides so flipping pancakes is easy to do. Sift flour, cornmeal, sugar, baking powder, baking soda and salt into a large bowl and whisk to thoroughly combine. In a medium bowl beat eggs then add buttermilk and melted butter. Whisk to combine. Mix wet ingredients into dry ingredients until just combined then fold in bacon, chilies, green onions, jalapenos and cheddar cheese. Set aside while you prepare skillet. If you have an electric skillet or griddle, now is the time to heat it to 350 degrees. Otherwise, place a large non-stick skillet over medium heat then let it come to temperature. Spray skillet with a light coating of cooking spray then add about ⅓–½ cup of batter for each 5"–6" pancake. Handle batter gently and do not stir, as you are trying to preserve as many bubbles in the batter as possible. Spread batter gently, letting the pancakes cook for 2–3 minutes on the first side or until nicely browned. Flip pancake over then cook an additional 1–2 minutes or until the center is firm to the touch and springs back when pressed. Remove from skillet and repeat with remaining batter. Serve nice and hot with plenty of butter, maple syrup and a sprinkling of pine nuts. You can totally make the batter a day in advance. Just take care to cover it with plastic wrap then store it in the fridge overnight.